Spread 1 cup coconut flakes on a baking sheet and bake until toasted, about 3 minutes. Transfer to a food processor; add the granulated sugar and pulse until finely ground. Line 2 baking sheets with parchment paper. Whisk the coconut-sugar mixture, the flour, baking powder, baking soda and salt in a bowl. Melt the coconut oil in the microwave; add to the flour mixture along with the vanilla and 1/3 cup water and mix with a wooden spoon until a stiff dough forms. Stir in the macadamia nuts and the remaining 1/2 cup coconut flakes; gently knead until the dough comes together. Divide the dough in half and shape into two 9-by-2-inch logs; place 1 log on each baking sheet. Bake, switching the pans halfway through, until the logs are firm and golden, about 25 minutes. Reduce the oven temperature to 300 degrees F.
Let the logs cool 10 minutes, then transfer to a cutting board; slice diagonally with a serrated knife into 3/4-inch-thick pieces. Arrange the slices cut-side down on the baking sheets. Bake, flipping halfway through, until just golden and the centers still have a little give, 20 to 25 minutes. Whisk the confectioners' sugar, coconut cream and coconut extract until smooth. 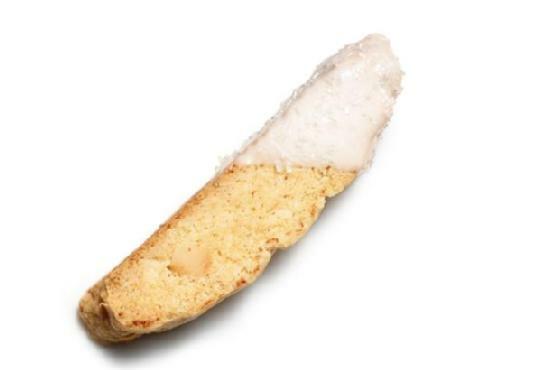 Dip the biscotti in the glaze; sprinkle with coarse sugar.